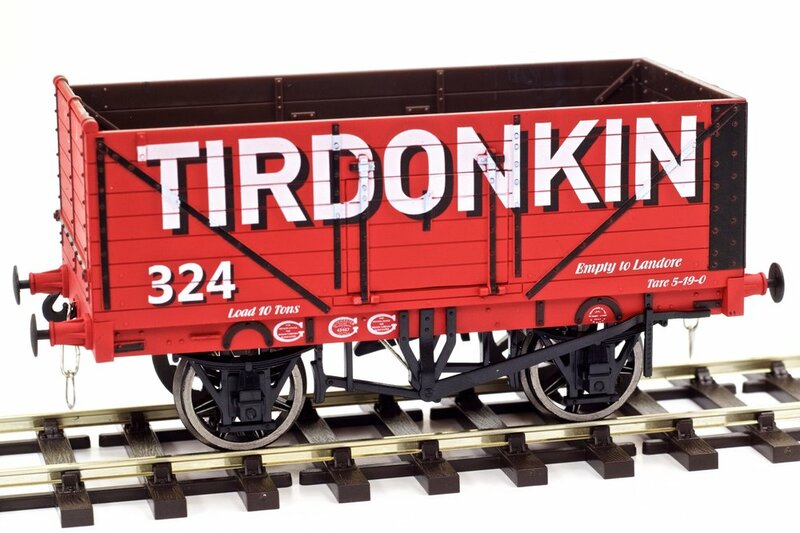 The artwork for the Tirdonkin commission has now been received and we are pleased to post it above, alongside photographs of the original wagons. As this is artwork only at this stage, the actual colours of the wagons when released will vary slightly. Consequently, No 284 will be far less brown, as shown, and rather more burgundy red. The above colours were scanned from printed artwork, hence the slight disparity which will exist between them and the finished products. For photographs of all of the sizes and all of the colours [! ], see our latest news update here. 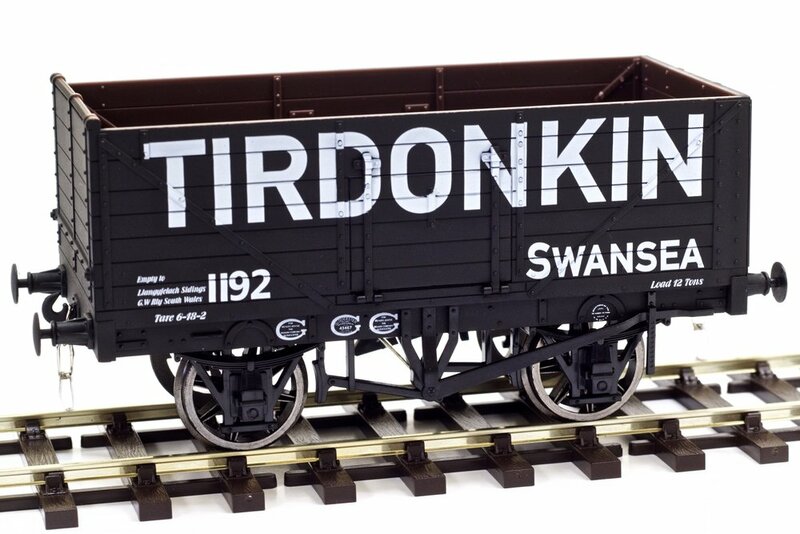 Encouraged by its success in selling its last private owner wagon commission in just 4 months, SRMG is delighted to announce its third Limited Edition Private Owner Wagon from Dapol Ltd., 'Swansea Wagons 3: The Tirdonkin Trio'. Delivery of the commission is due in September 2017 with the wagons being launched at the 8th Swansea Model Show on 7th & 8th October. Club members and existing collectors will be notified of the upcoming launch and will be able to order and pay for their stock prior to the show but delivery will only take place from 7 October onwards. Every 7-plank wagon set will contain a laminated Limited Edition numbered card. A split pin will be added to all of the 0 Gauge sprung couplings, preventing the coupling spring from dislodging when lengthy loads are hauled. 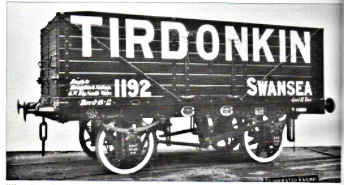 A label proclaiming 'Swansea Wagons 3' will appear on each box. 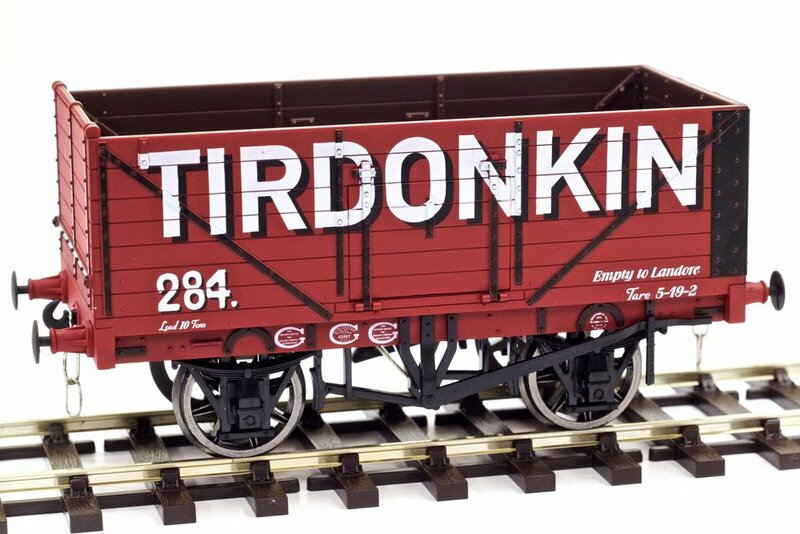 The wagon colours are 2 in red [different shades] and 1 in black, as depicted by the Dapol artwork. Wagon 284 has an unusual figure ‘4’, deliberately replicated from the original black and white photograph. Further, SRMG will, if required, introduce buyers to a display case supplier but will not be marketing cases themselves as part of this commission. SRMG does not repeat its commissions and so when these wagons are sold there will be no more available. A second hand market has already appeared in stock from the earlier commissions. So, once again, SRMG has stolen a march on other private-owner commissioners and remains the only organisation to commission stock in all three gauges. As with our earlier projects [qv], these will sell well and quickly, consequently an early expression of interest is recommended. The Tirdonkin Colliery at Llangyfelach was one of the smaller collieries working to the north of Swansea. Opened by Tirdonkin Collieries Ltd., it was formed in 1895. Sinking Tirdonkin's shafts began in early 1899. Difficulties were encountered however and work recommenced at a new site in December 1901. To serve the colliery, a 2 mile mineral line between it and the Cwmfelin Tinplate Works was established but in 1912 a new connection northwards to Llangyfelach was made and the majority of coal probably went out this way [Llangyfelach was on the Great Western line]. The Tirdonkin Collieries Company Ltd. operated the colliery until 1920 when the company went into voluntary liquidation, possibly to enable a reconstruction of the company as the Tirdonkin Merthyr Collieries Ltd. which was itself incorporated in 1920. Clearly briefly successful [the colliery was described in the 1924 'South Wales Coal Buyer's Guide' as one of Glamorgan's principal steam coal collieries] the company ran into financial difficulties following the 1926 Miners' Strike and closed down completely in 1928. 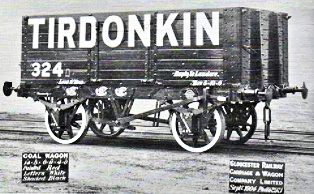 The wagons which form the 'Tirdonkin Trio' commission show Tirdonkin Collieries' general preference for the products of the Gloucester Railway Carriage and Wagon Co. Whilst No 284 is a 7 plank,10 ton vehicle built by the Ince Waggon [sic] and Iron Works in 1904, No 324 is a similar size and payload vehicle built by Gloucester's, again in 1904. No 1192 is a Gloucester 12 ton, 7 plank wagon from 1923. 284 and 324 show 'Empty to Landore' whilst 1192 shows 'Empty to Llangyfelach Sidings, GW Rly, South Wales'. The strange interpretation of the number 4 in wagon No 284 is prototypical. We acknowledge with gratitude Keith Turton's 'Private Owner Coal Wagons Vol 9' [Lightmoor Press] for providing some of the detail above.